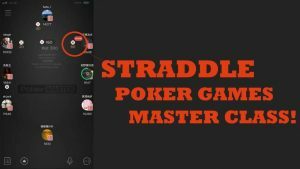 STRADDLE POKER GAMES: strategy adjustments and more! DOES IT EVER MAKE SENSE TO STRADDLE? A live straddle, or simple straddle, has been a feature in live Hold’em poker games for quite a while now. In fact, it is so popular that some of the online poker sites have decided to introduce straddled games as well. While players’ opinions on the merits of straddling may differ, the simple truth is that these straddle poker games require certain adjustments to maximize your profits and limit your exposure at the table. Although most people reading this are probably familiar with the concept, it is worth briefly explaining what straddle is given the nature of this article. There are few different straddle variants, but today we will be concentrating on the most common one, where straddle is the extra (the third) blind posted by the UTG player and it is worth double the big blind amount. So, in a $1/$2 game, the straddle is $4. Like the blinds, a straddle is posted before cards are dealt, so the UTG player is willingly putting two extra blinds in the pot without any idea about the strength of their hand. The only advantage he gets from posting the straddle is that he will be acting last before the flop as the preflop action, in this case, begins with the UTG+1. How Does Straddle Affect the Game? In the simplest of terms, the live straddle makes for a bigger game. If we’re talking about a mandatory straddle, the term almost losses its meaning, as it effectively means everyone has to post those extra two blinds when they are UTG and it becomes three blinds poker game. So, in a $1/$2/$4 games, every pot will be $7 right from the start. Given the size of the pot is one of the most important factors in determining your raise sizes, it is clear that a straddled game will play shallower stack to pot ratio and use bigger sizings. Games with voluntary straddles definitely leave more room for strategic planning. In these games, it is usually those players who want to gamble it up who will be posting straddles whenever they have a chance. Even the mere fact someone is eager to post a straddle and play a bigger pot regardless of their cards is a clear sign these players have come to play and won’t be giving up that easily. First of all, if you sit down in a $1/$2 game with a standard buy-in of $200, you’re expecting to start a hand 100 big blinds deep. However, the moment someone posts a straddle, you’re effectively cut down to 50 big blinds for that particular hand. If a normal open is $7-$8, it is likely to increase to $12 or more when there is a live straddle out there. Value of hands such as small pocket pairs or small to medium suited connectors is reduced significantly in these situations. With a bloated pot, your implied odds simply aren’t there, although it may seem tempting since it will be easier to get money in the middle if you do nail the flop. One way you can try to adjust with these types of hands is to add some limps to your range. Although open limping generally isn’t the best strategy in Hold’em, if other players at the table are not experienced and will let you get away with it, you can over limp few hands from the later position, especially if the straddling player hasn’t shown propensity to take aggressive lines. On the other side of the spectrum, you should probably play your big hands more aggressively when there is straddle on. Simply put, if you have a hand like pocket Jacks or better or AQs+, with a raise and a couple of calls in front of you, you can comfortably look to get your chips in. This is, of course, situational (as everything in poker) but in an average game, taking very aggressive lines with the top of your range is guaranteed to make you the most profit. The fact of the matter is that many straddle games don’t play that crazy as it could look at the beginning. Although people seemingly want to gamble it up by throwing in extra money blind, they aren’t as enthusiastic when they see their cards, which, on average, won’t be that strong. Still, they might want to see the flop just the same, so some of them will be limping in or making “fake” mini-raises in hopes of getting what they want cheap. You should always stay alert and recognize these situations as they arise. Whenever you see people limping in or making what you know to be weak plays, take advantage of your position and go after the pot. Obviously, you shouldn’t be raising with 100% of your range, but if you’re seated in the cutoff or dealer seat, you should definitely be looking to raise and take it with a fairly wide range of playable hands, especially if you have good blockers. Even if you don’t get to win many pots before the flop, you’ll usually be left with one or two players and you’ll have a position on them. Between the times you hit the flop hard and the times they miss and give up when you c-bet, you should be showing a decent profit. All of this applies to non-straddle games as well, but when the straddle is on, you simply have more reason to go for it. Plus, the lowered SPR will make certain post-flop situations easier to play, e.g. it will be much easier to get your money in with a nut flush draw and not worry about it too much as math supports it. Same could be said about your top pairs and many other holdings, but you still have to understand and make those changes to reach better results. No poker player worth his or her salt will ever advocate for throwing money away blind. Generally speaking, straddling is a losing proposition and there is no math that can show otherwise. Putting two big blinds in without looking at your cards won’t get you very far. That said, there may be some situations, particularly in live games, where straddling may make sense from the meta-game perspective. If the game is very loose and there are several players looking to gamble, you don’t necessarily want to be perceived as that tight nit no one wants to give any action to. So, posting an occasional straddle to make people happy can be worthwhile. Also, if the game reaches the point where almost everyone is straddling and stacks are deep, there isn’t that much downside for a good player to straddle as well. It does mean the game will play bigger but if you’re comfortable with the effective stakes and believe to be one of the best players at the table, you want to build and play big pots against weaker opponents. So, all in all, playing in straddle games can be very advantageous for good players. As long as you adjust your range correctly and are ready to go after all the dead money in the middle, you should be able to show a significantly higher profit than in regular, non-straddle games played at the same level. In most straddle poker games, adopting some fairly simple adjustments and playing solid strategy will be all you need to increase your edge if you only face those situations from time to time. Not bluffing and bluff-catching enough or in the right spots and much more. So to help my students master these concepts and make the right strategy adjustments for straddle poker games I created “Straddle Poker Games Master Class” where I share my experience and solved ranges for many different situations. Thus, if you ever play in such games online or even face occasional straddle pots in live games, you can learn a thing or two and essentially become the best player at the table in your straddle poker games! Join Straddle Games Master Class! The Best Mobile Casinos For Poker Players Who Are The Fans Of Poker Legislations In The US?